ARM stock grows to overweight, gets Morgan Stanley's "Best Idea"
British mobile chip architects ARM’s stock is probably one of the best investment opportunities at the moment. That’s the conclusion one can draw after Morgan Stanley raised its rating on ARM Holdings from Equal Weight to Overweight. “The risks on earnings remain clearly on the upside,” analyst Francois Meunier explained. ARM’s got a two-year headstart on Intel in the mobile market. These were the reasons behind Morgan Stanley’s promotion of the stock to “Best Idea.” The tipping point? The iPad, of course, but also Windows 8 on ARM. “Long-term unit forecasts provided by ARM have often looked too optimistic when first published but retrospectively have proven too pessimistic – 50-120% for the overall addressable market and 20-40% for the wireless market in the past ten years. Price elasticity in semiconductors, launch of new form factors such as smartphones and tablets, and increased demand from emerging markets for tech have been the main drivers of upside in the past five years. Assuming this innovative trend continues in the next five years, we can see a bull case scenario of 37 pence EPS for ARM in 2016,” Meunier said. And for the time being, ARM’s success is not hugely dependent on the upcoming Windows 8 platform, so even if something goes wrong with Windows 8 on ARM, the chip designer still has plenty of space for growth. Morgan Stanley also asserts that despite Intel’s efforts, the company won’t be able to catch up with ARM in the coming two years. Intel on its part is looking for partners to bring its Atom chips to mobile devices and so far Motorola, Lenovo and Orange have announced devices with its silicon. History repeats itself. No one can stop Intel. Remember, Intel's single core processor beats all the dual core processors including the ones on Samsung Galaxy Nexus and Galaxy S2. Check the benchmarks. Agree. Intel's expertise can't just be put aside. I'm actually seeing Intel becoming a major mobile chip manufacturer in the next 3-5 years. The next 1-2 years will be their show time era, where they prove the quality of their initial offerings. 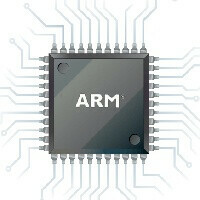 Right now, Intel can't compete with arm on mobile devices. They are paying the price for not taking mobile computing seriously. Have to agree. They put more effort in developing supercomputers. Of course those are useful for big companies, but not homes and common people. Mobile devices are the PCs of the future.